If you have a missing tooth or multiple teeth missing, dental bridges can be a good way to improve your appearance since your dental bridge cost is more affordable than other options. Your family dentists in Brooklyn, who also is one of 2018 America’s best dentists, provides extensive information on a dental bridge vs implant when you face replacing missing teeth. If you have questions like — how long does a dental bridge last? – how does it feel or what’s the best alternatives for your specific needs — he’ll answer them. Whether you have missing teeth due to injury, decay or disease, the gap between your teeth can affect your health and lifestyle in a number of ways. Dental bridges provide an artificial tooth to “bridge” the gap left by a partial tooth loss of one or more natural teeth. The bridge for teeth is held in place by two or more crowns for the teeth on either side of the gap. Occasionally, instead of using crowns on the adjacent teeth, especially if the gap covers several teeth, implants may be placed as the supporting abutment teeth for a fixed bridge. Your Brooklyn cosmetic dentist only uses this technique if the gap covers the entire side of your mouth or your present natural teeth aren’t strong enough to provide adequate tooth bridge support. Traditional bridge provides a crown for your natural adjacent teeth on either side of the gap. This is the most common kind of tooth bridge, and it’s usually made of porcelain fused to metal or ceramics. Cantilever bridge works best when you only have one supporting side for the missing teeth. The cantilever bridge dental process isn’t very common, nor often recommended by your Brooklyn dentist, especially in the back of your mouth because the force placed on your remaining teeth risks damage. Maryland bridge (also called resin-bonded bridges) are made of porcelain, porcelain fused to metal or plastic teeth and gums supported by a metal porcelain framework. A Maryland bridge is a cost-effective method, they’re often bonded on just one side, usually the back of existing teeth. Implant supported bridge follow the same process as traditional bridges, except they use implants as abutment teeth instead of crowns on your remaining natural teeth. You don’t have to consider dental bridge vs implant when both are part of the solution. Implant technology advancements have allowed this method to replace cantilever options while providing stronger support if your natural abutment teeth are partially damaged. Your first visit incorporates the preparation of your abutment teeth. If you opt for crowns, your teeth are re-contoured by removing enamel to provide room for the crowns. As for the types of bridges, if you and your Brooklyn family dentist decide implant supported bridge will work better for you, you have the implants placed either during this visit or in the following visit. Impressions of your teeth are made to serve as a model to make the teeth bridge, abutment teeth crowns and fake tooth. The best Brooklyn dentist places a temporary bridge in the gap to protect the exposed teeth and gums until the lab makes the permanent bridge. On your second visit, the temporary bridge is removed and the new porcelain or metal bridge is checked and adjusted as necessary for a proper fit. 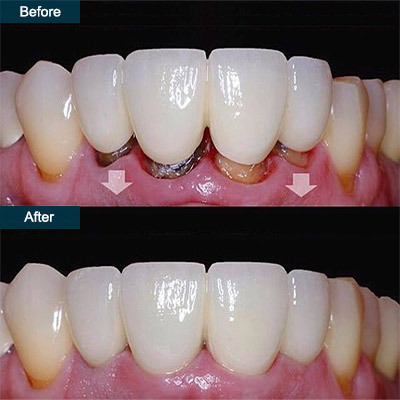 Your dentist then permanently cements the fixed bridge in place. It’s hard to give a dental bridge cost estimate. Insurance should help cover at least a portion of your costs, though the cost of dental bridge may vary depending on your needs. There are several ways to replace missing teeth. Dental bridges often represent the more affordable replacement option. With proper care, dental bridges will usually last from five to 15 years and in some cases longer. Aftercare includes normal good dental habits and regular checkups. The issue of dental bridge vs implant takes into consideration issues such as dental bridge cost, abutment teeth health, durability, how long does a dental bridge last and esthetics — everything that should be discussed with your cosmetic dentist in Brooklyn. Do you have any questions about the dental bridge procedure in Brooklyn? Would you like more bridge dental work information or schedule an appointment with the best rated Brooklyn bridge dentist Khabensky DDS of Family Cosmetic & Implants Dentistry of Brooklyn? Please contact our dental clinic for a consultation with the dentists Alex and Igor Khabensky DDS.